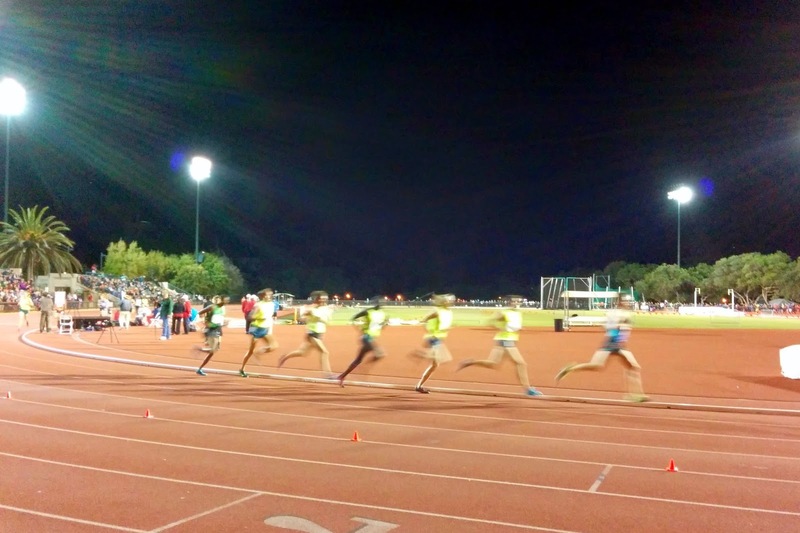 This past Sunday I spectated for Payton Jordan, a star-studded track invitational at Stanford. All I can say is - wow. Technically I've been to track meets of the high school variety, but I've never been to a pro and collegiate event with so many fast people. Even more exciting? A bunch of ladies from Oiselle HQ, plus well-known pros Lauren Fleshman and Kara Goucher, joined us in cheering for the runners. I've followed Kara for years, and it was a dream come true to meet her and to chat with her in real life. 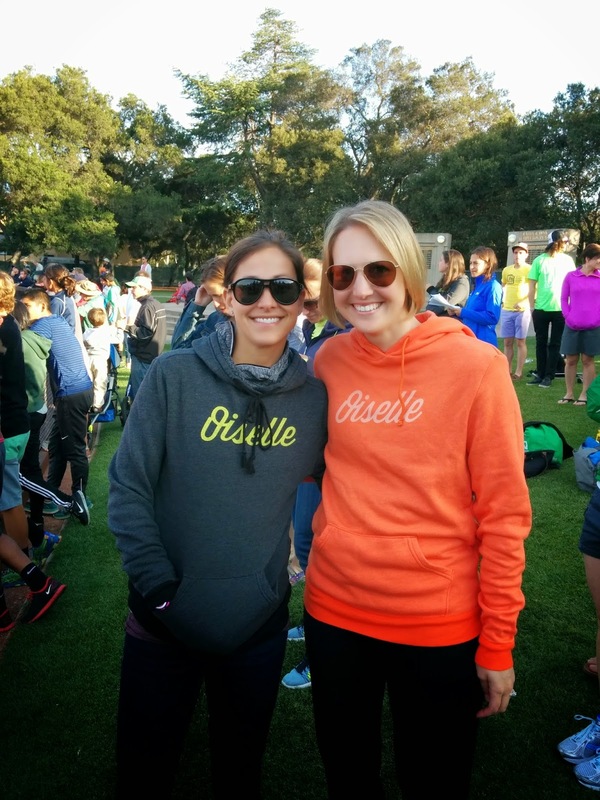 I also loved catching up with Oiselle team friends and meeting new ones. 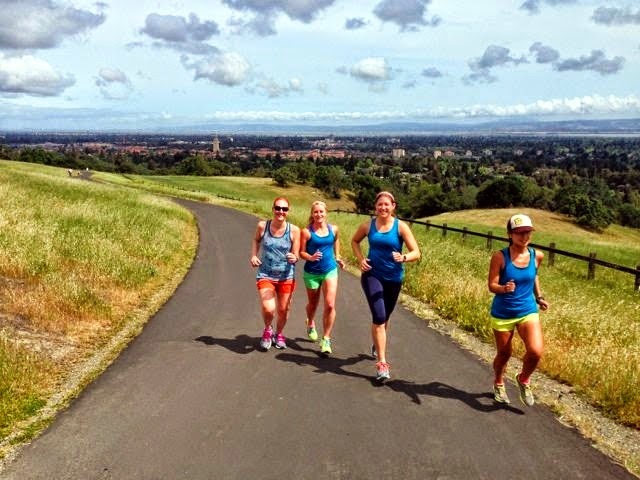 Rewinding a little, the day started off with a long run in Palo Alto. 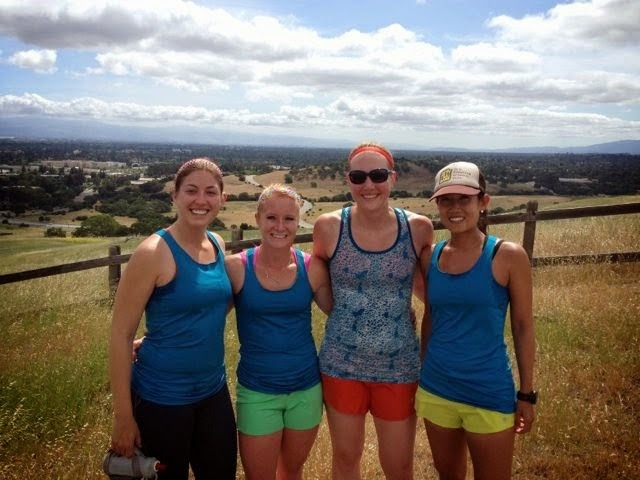 I joined Sophia, Kevin, Laurel (in town from Oregon), and Michelle on a trip up the dish trail and around Stanford campus for 10 miles, then Kevin and Laurel continued the run to top out at 20 miles for the day. The last time I ran the dish it was super hot and didn't leave a great memory, but this time it was gorgeous. I was even impressed with my ability to run almost all the way up the hill. The benefit of being slower than the others was that Michelle got a great photo of me near the top. Down a little and up again...because why not? 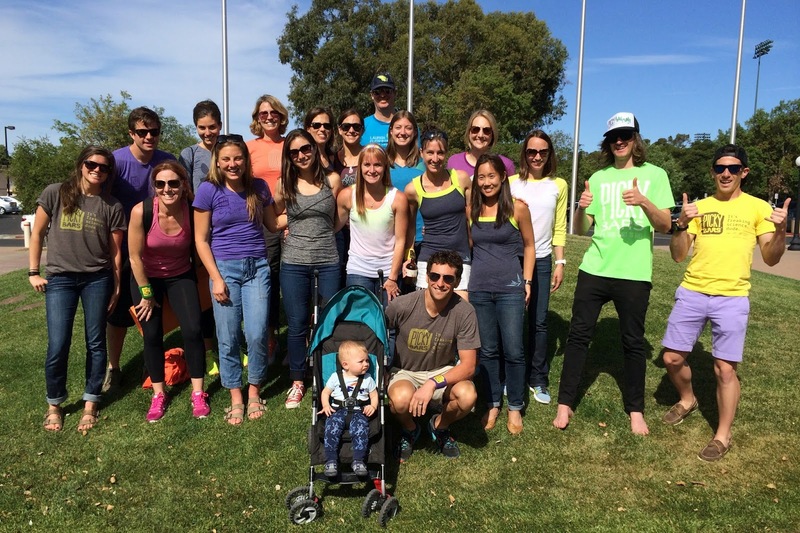 After some foam rolling and showering, we headed over to the Stanford track to tailgate with the Picky Bars crew. A big shout out and thank you to Picky for feeding us post-long run! It was also pretty amazing to congratulate Jesse in person after his big Wildflower 4-peat the previous day. Once we headed into the meet, I was in awe of the runners and running coaches that I've otherwise only seen on TV. Many of the Oiselle runners had a great day, including Lauren Wallace with her 800m PR, Lauren Penney with her 5K PR, Kara Foster with a huge 10K PR, and Kate Grace with a PR AND a win in the 1500m. More highlights were meeting Devon, a runner for UM that I've talked with by email in the past, and seeing Lauren Fleshman chat with many collegiate runners who were super happy to meet her. In addition to cheering on Oiselle team, I enjoyed watching some big names race especially in the 5K and 10K. The men's 5K was stacked and the top two men (Ben True, Hassan Mead) finished in 13:02, putting them in the top 10 fastest US runners in the 5K ever. (See more in this Oregon Live article.) I attempted photos during the event, but all I got were blurs. The Women's 10K included Jordan Hasay, Kim Conley, and Molly Huddle, three runners I was thrilled to see race. 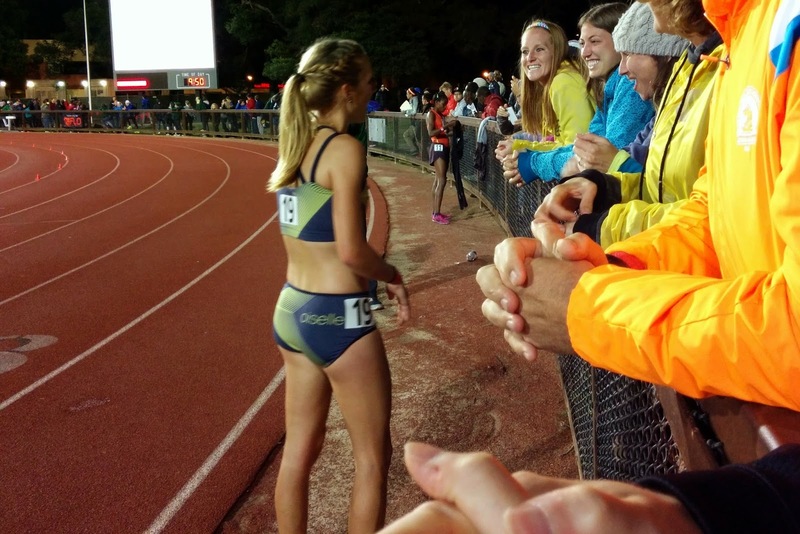 Molly's second place finish made her the second fastest US woman in the 10K! Wow. 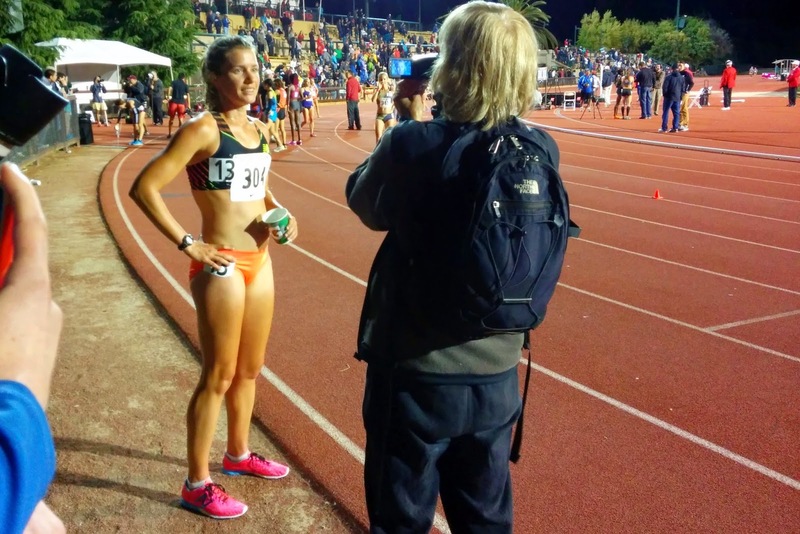 Kim Conley's FloTrack interview after the 10K. Kara Foster chatting with our group after her big 10K PR. After the meet we headed to the Dutch Goose for a little celebration. It was a super fun place that I'll need to return to at some point - good beer and good food. I loved the time to talk to the racers and to continue hanging out with everyone. I was sad to leave, but I have to say I need to do more track cheering someday. So much fun! This is awesome. I'm jealous you got to go! I would love to watch a pro track meet. Maybe I should go to some of the collegiate ones next year? It was a great route - thanks! And sounds awesome on the track meet - and you got to meet Kara! 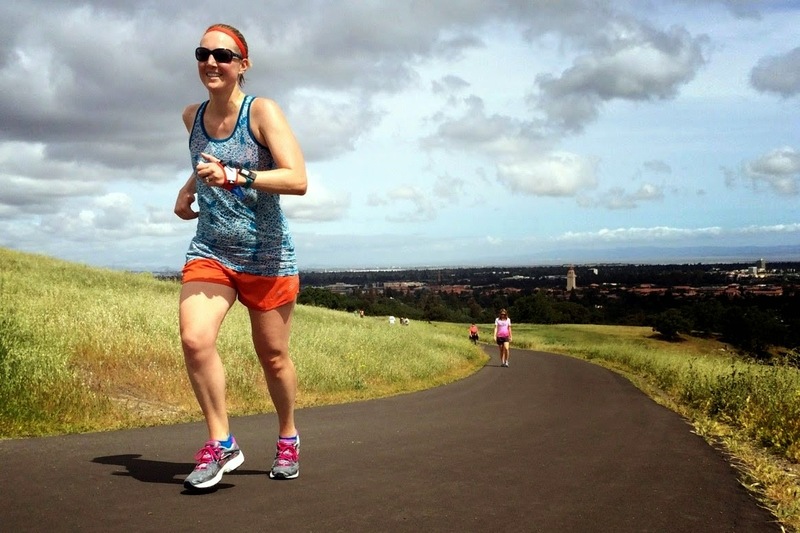 She seems to be all the rage again after signing with Oiselle and then with Skechers. Yes she's great! I loved meeting her. :) Thanks for the comment!